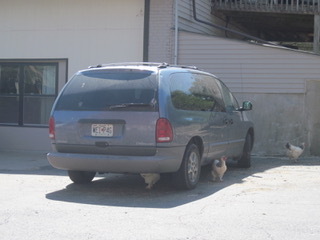 When I reached Cherith Brook Catholic Worker House in Kansas City, Missouri, I did not expect to see chickens loose on the driveway. 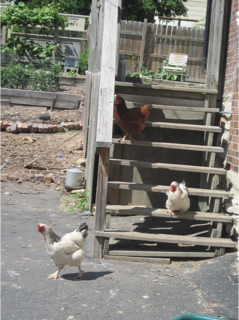 I’m not sure why I was so surprised—other urban Catholic worker communities I visited had backyard chickens. But it was a dreary day in a dreary neighborhood, and I had driven through the east side of Kansas City, with little sign of animal life or greenery. Cherith Brook’s chickens, gardens, and beehives were an oasis of nature on their city block. I had come to the Cherith Brook community to conduct research for my book Living Sustainably: What Intentional Communities Can Teach Us About Democracy, Simplicity, and Nonviolence. I had been visiting intentional communities, such as eco-villages and Catholic worker houses and farms, to see how they integrated sustainability and nonviolence into their daily lives, and I was especially curious about urban communities. The chickens, as it turned out, helped me understand how the residents of Cherith Brook practiced their core values of nonviolence, hospitality, revaluing land and labor, community, and downward mobility. 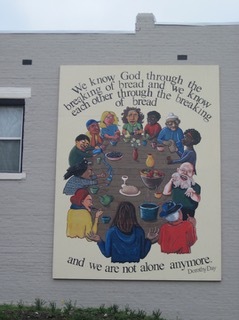 To learn more, I volunteered in their hospitality mission. So, for several days, I did laundry, served food, and worked in the garden—whatever they needed at any given moment. I worked side by side with other volunteers, some of whom were also guests and relied on Cherith Brook for means and clothing. One volunteer said he had been displaced due to a fire, and I saw how easily one could slip into homelessness. Two men I met while volunteering told me that they regularly care for the chickens, each responsible for two days per week. They enjoyed caring for the chickens, and I could see why. Caring for these chickens was probably one of their few opportunities to bond with animals. 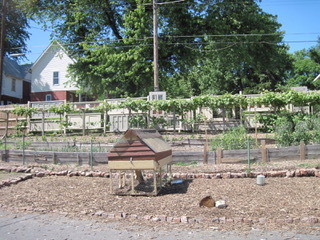 The chickens and the bees were indeed “city creatures” and helped residents, guests, and volunteers sustain or re-establish connections with the natural world in this urban setting. The Catholic workers at Cherith Brook emphasized nonviolence towards other people and towards the natural world, so I wondered about the relationship between meat and nonviolence. As part of their hospitality mission, Cherith Brook serves breakfast five mornings a week and the meals I helped prepare all included meat. 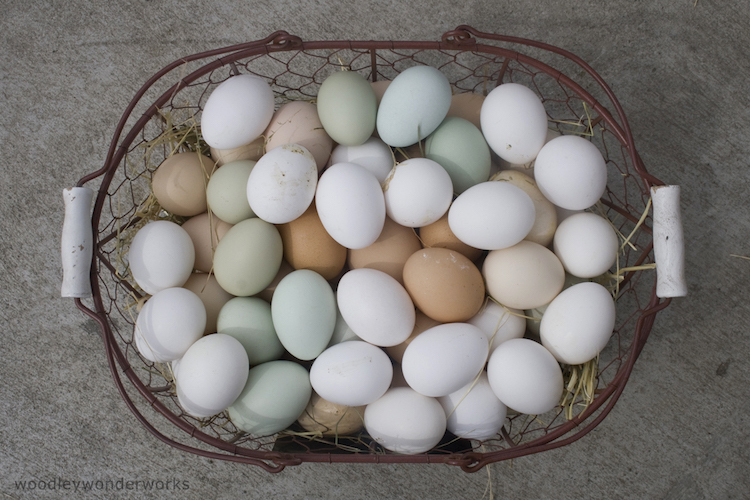 I never asked the men responsible for feeding the chickens if they viewed the chickens as potential food, although I knew that the community used the eggs for breakfast. One man had come from a farm family and was well aware of the reality of eating, that something—fish, animal, or vegetable—must die so that we might eat. One afternoon I worked in the gardens with Elizabeth, a Cherith Brook resident. We sat in the front yard on a sunny day, first preparing the garden bed, then planting seedlings, and we talked about meat, nonviolence, and Cherith Brook’s hospitality mission. She told me that while some Cherith Brook residents and volunteers themselves prefer a vegetarian diet, most of their guests want meat. Their guests, she said, see meat as a luxury, a rich person’s food, and the guests appreciated the opportunity to eat typical American meals. The residents of Cherith Brook aim to create a solidarity with the poor and with the people they serve, and downward mobility is a stated goal. To live simply, practice alternative economics and voluntary labor among people on the margins and excluded from life’s resources. Downward mobility comes at personal surrender and connects us to an economy of grace. (Luke 9:57-62; Mark 8:34-38; Matthew 6:19-21, 25-34, 7:13-14). In solidarity with our street friends, I eat what is present. Solidarity is transformative for all of us, so I will eat dumpstered supreme pizza if that is what is available. Anthropologist Claude Levi-Strauss is credited with the phrase “animals are good to think with,” and Cherith Brook’s chickens prompted me to think about tensions between vegetarianism, hospitality, and nonviolence. I saw how Cherith Brook’s gardens, chickens, and bees helped the community fulfill some of their core goals, especially those related to sustainability and connections to the natural world. At the same time, residents had to balance competing values in service of their goals of fellowship and solidarity with the poor. Nonetheless, in their block of Kansas City, Missouri, Cherith Brook created a space and a habitat that welcomed all members of the biotic community. Before I left Cherith Brook, I walked through the backyard, to see the bees and gardens and especially to say goodbye to the chickens. As they clucked about the yard, I thought of possibilities for solidarity in the city—between humans, and between humans and nonhumans. It occurred to me as I wished the chickens well that some measure of the “sublime mystery” of solidarity was pecking and scratching a few feet from where I stood. Whitney Sanford is a professor in the Religion Department at the University of Florida, specializing in Religion and Nature. She recently published Living Sustainably: What Intentional Communities Can Teach Us About Democracy, Simplicity, and Nonviolence (University Press of Kentucky, 2017). She is currently conducting ethnographic research on the river people of Florida.